Recently I went to my university library to look for its Tibet section and found that there was so much literature, specifically contemporary literature, lacking. Sure there were some books that I was happy to have found like “The Struggle for Tibet” by Tsering Shakya and “Tibet’s Last Stand? ” by Warren W. Smith, Jr. however I felt sad that my Tibet section looked so meager. I got to thinking, how can I add to this section? and essentially, how can I make it so I can access more histories/information/discourses about Tibet for not only for me but for Tibetan students like me? After spending some time in Dhasa with historian and national treasure ( རིན་ཆེན་ lol) as Carole McGranahan calls him, Tashi Tsering la from Amney Machen recommended a huge list of books for me to read so I decided that I would try my best to fulfill his list in my university’s Tibet section of the library. When looking at being able to access our own histories, I’ve realized that it is when we can reclaim our stories, read works written by Tibetan writers and non-Tibs that we can be critical of what scholarship is out there about Tibet and start to resist. The Lhakar movement proves to us that resistance can take any form, in a recent facebook post, Cho Tendorla accurately describes it as “a one-size-fits-all movement” where the actions we take can not be stopped by the Chinese government but in fact empowers us as individuals and as Tibetans. They can’t stop me from learning and they won’t stop me from getting the books I want. This is how I’ve chosen to resist. So I did some digging around at my university, made some inquiries and found out that I can make requests to my library to purchase books that aren’t available in its directory. A couple Lhakars ago I made a request for my first book, “Arrested Histories: Tibet, The CIA, and Memories of a Forgotten War” by Carole McGranahan and now….ITS ARRIVED!!! When I got word that my book had arrived, I thought to myself “this is what Christmas must feel like.” Now I’m so excited to get my next book! I’ve put a request in for “Dreamworld Tibet: Western Illusions” by Martin Brauen which looks at Western conceptions of Tibet throughout history and deconstructs them as they have been exploited by the West. This past year, I’ve really been struggling with enjis (even other people of colour) appropriating Tibetan culture and I hope that this book will give me some historical insight into the exposure of Tibet in the West to start to understand the fuckery I’ve been experiencing. Until next time, keep it interesting and keep on resisting in your own way. ← Calling All Tsampa Eaters! Great job my dear. You’re privileged to be studying and exploring things in the west! Be the best representative of Tibet and Tibetan. All the best! Rinchel la, thank you so much for writing this article. 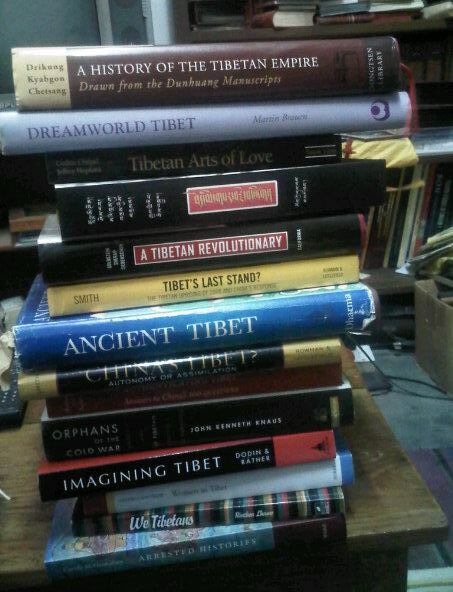 I now have acquired a great deal of knowledge about the historical books on Tibet. I will also try to read as much as of the books you have recommended.